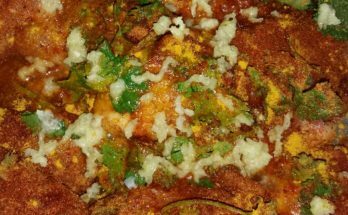 Italian Fried Chicken Cutlet Recipe- So Delicious! August 22, 2017 March 2, 2018 - by Jamie - 19 Comments. Surprisingly, I find that there must be quite a few ways to make a chicken cutlet. I know this because I am often astonished when I order one at an Italian restaurant I have never been to, and they have some how managed to really mess it up. It is so disappointing when this happens, because it is truly one of my favorite guilty pleasures. 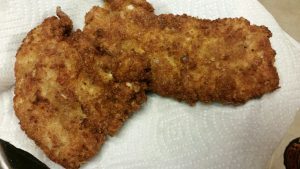 So, in order to help you all make your own at home and avoid the potential sadness from going out and getting something less than you deserve– I will now share my delicious Italian fried chicken cutlet recipe with you all! As some of you may know by now, I am half Italian (well, Sicilian actually). One of the wonderful dishes I remember my Grandma (not the same Grandma as my easy baked chicken thighs recipe) making was fried chicken cutlets. Although I do not know her exact methods, I have come up with my own wonderful version that still totally hits the spot. The breading is super important. There is really only two parts to this dish: The chicken and the breading. So, if you mess up either one of these it isn’t going to be good. One crucial thing about the breading is not to make that weird greasy, floury coating that just falls off when you go to cut into the cutlet. It is really crazy how often I come across this at restaurants. Also I am not a big fan of Panko, even though it’s all the rage. Most of the experiences I have had with it is that it doesn’t evenly coat, which just does not make an excellent cutlet in my opinion. With that said, here is my secret breading ingredient…croutons! This is the easiest, yummiest way I have found to get a nice even and lightly crunchy coat. I usually just buy a bag of whatever brand flavored croutons are on sale. I lean towards the garlic seasoned variety if I can. The last bag I bought was $1.25. Then I pour the whole bag in the food processor and grind it down to a powder. It takes less than a minute. Depending on the size of the breasts I usually get one or two per person. I always try to make enough to have some leftovers. You want to pound out the breasts to about 1/4 inch thick. I must say this is the hardest part of the whole process. If you go the gym and do arm exercises on a regular basis, then this may be nothing for you, but for the rest of us it’s a bit of a workout. Don’t get me wrong though, it is totally worth it and it is probably not a bad idea to burn a few calories before you indulge. Make sure you wrap and cover you chicken well so that you aren’t splattering raw chicken all over your kitchen. I generally put it in a plastic baggy and then put that inside of one or two plastic grocery bags. When you are beating the meat it tends to rip holes in whatever is covering the chicken, so I like to double or triple wrap to avoid leaks. Once you have your chicken the desired thickness you can season it. I recommend a sprinkle of salt, pepper, and garlic powder (not garlic salt) on both sides of each piece of chicken. Your breading will have seasoning too, but you don’t want your chicken to be bland. You are going to need 3 plates and a bowl. Put the flour on one plate and add 1/4 tsp of salt and a 1/4 pepper to the flour and mix it around. Crack the 3 eggs into a bowl and whisk it. Put about half of your crouton powder onto the next plate. Now you will take one piece of chicken at a time. First lay the breast in the flour and then flip it over and get the flour on the other side. It should be a very light layer, not chunky or globby in any way. You should be able to see the chicken through the flour. Then dip the chicken in the egg. Make sure every part of the breast get covered in egg. Pick it up letting the excess drip off for just a second. Then place on the crouton plate. Cover every part with the breading. Press it on both sides making sure it stick and is totally covered. As you finish breading each cutlet lay them on a plate together to wait for cooking. It is ok to pile them up. Add more of the ground croutons to the plate as needed. You will want to use a large frying pan. Fill it up with about 1/2 an inch of canola oil. You want to make sure you leave enough room for the oil level to rise with the addition of the cutlets without even getting close to overflowing. You just need enough to barely go over the top of the cutlets. Heat the oil on high until it sizzles and pops when you flick a drop of water in it. I am sure there is some perfect temperature, but this how I learned to test the oil and it has always worked for me. When the oil is hot take two of your cutlets and gently place them into the oil. If you have smaller pieces you can put an extra one in. You just don’t want to over fill the pan, because the oil will cool down if there is too much chicken in there and it is important that each piece is surrounded by oil and not touching another cutlet. If the cutlet isn’t completely submerged in oil that is fine as long as most of it is. Because the temperature can vary depending on how much oil you have and how much chicken is in it, you just need to keep an eye on it. 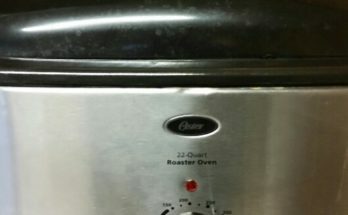 I typically turn it down to 8 (out of 10) on my stove when I put the first pieces in, but if it doesn’t appear to be totally sizzling like it would in a deep fryer turn it back up again. I have a hard time just letting my food sit there without checking it out. So, I usually give it about 2 minutes then lift one corner (with metal tongs) of the cutlet and see how it looks. You want each side to get a nice deep golden brown. I usually end up flipping each one 3 or 4 times, making sure each side has good color. Once the whole cutlet is evenly golden brown on every side, it is done! Takes about 8 to 12 minutes depending on your heat levels, but when it looks done- it is done. It’s pretty simple to judge. If it is not a golden brown keep cooking it. If it starts getting too dark or burnt better get it outta there. This is really making me hungry! As you cook your cutlets and remove them and add the next batch to the pan your oil level will decrease. If you started with enough oil you should be totally fine. If you absolutely need to you can add more, but the problem is it severely decreases the temperature of the oil and your cutlets will not fry right. So you want to bring the oil back up to temp, but try to avoid this, because it doesn’t always work out right. Ok! All your deliciously fried chicken cutlets should be there just waiting for you to eat them. There is a few options on what you can do with them from here. The way I always ate them growing up was with fresh lemon and possibly a side of spaghetti noodles flavored with butter and garlic and grated Parmesan. You can also easily make this into Chicken Parmesan by adding your favorite marinara sauce and fresh Parmesan cheese to the top. I have also used provolone cheese as a topper for this. And I like to serve it with fettucine noodles with marinara. Chicken cutlets actually span across a lot of different countries and cultures, even though they might call them something else. You can really make this recipe fit a lot of different food moods that you may be in. You can also use these cutlets for a variety of sandwich options, or serve them up with french fries and pretend they are chicken strips. Or cut it up and put it in a salad…There are truly many, many options. I don’t want to forget to suggest some ways to spice up this recipe! If you are using it in its original form, and Italian chicken cutlet, I would recommend a sprinkle of hot pepper dust on the finished product. The pure dusts work really well for giving something a good kick without changing the flavor much, if at all. You just have to make sure it doesn’t have any additives like sugar or it will totally change your food. If you are using the cutlets for a sandwich that opens up a whole bunch of hot sauce option depending on the style you are going for. If you are just going to do a standard American style Franks Original Hot Sauce would be great! Usually a heat level of 8 out of 10 is good, but every stove is different. Just make sure the oil stays hot and the cutlets are frying like they would in a deep fryer, the oil will cool as you add chicken, keep it hot. Well, I hope you totally love my Italian Fried Chicken Cutlet Recipe! If you have any questions, comments, or suggestions please let me know! I haven’t made chicken cutlets in a very long time, and when I saw your recipe here it got my attention. I agree with the breading being important, it has to be coated properly also. 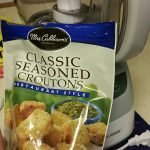 I would have never thought to use croutons. I was wondering, I use the crockpot a lot it’s convenient for me. Do you think this recipe would work for placing them in a crockpot? 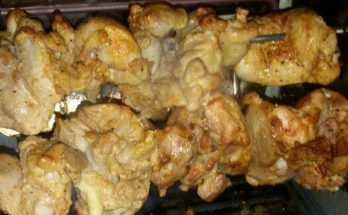 The way the chicken is coated looks like it would stay on as long as you don’t touch it while it’s cooking. Thanks for sharing your crouton secret! Hi there! Interesting question. I am not to sure about using a crockpot for this. I guess you would sort of be baking them in it. I haven’t ever baked these. I guess it might be ok, but the coating wouldn’t get the same nice crisp to it. Also, chicken cooks fairly fast, especially when it is thin cutlets like these. If you are trying to just put them in your crockpot to let them cook while you are out doing stuff, it seems like they could get very dry. Another thing is that if they were stacked in the crock pot the outside of the cutlets wouldn’t cook evenly. I am really trying to think of way for you to do it, but I just don’t think it would work. But if you if you did the work of pounding them out and getting them breaded, the cooking part is pretty quick and easy. I have been using a crockpot for over 30 years and have experimented with most recipes. I think these will be fine, they won’t dry out in a crockpot because it’s a slow cooker and they would be really moist and tender. Having them crispy of course wouldn’t happen, I wasn’t expecting that. I have stacked chicken, ribs, porkchops and they do cook evenly because of the length of time left in there. I can’t fry a lot, it’s rare I do but I think both methods would be awesome. Thank you for this great recipe and for your help! Very interesting Patsy. I had no idea all those things could be done in a crockpot. If you do end up trying out this recipe, you should check back in and let us know how it turned out. I would think a variation of chicken cordon bleu might turn out really well with your crockpot cooking too. Thanks for the information! It looks really delicious but I live in suburbs of Thailand and I am sure I can’t find Canola Oil in here. Do you have any suggestion for it? I am sure whatever oil you guys use over there would work just fine. I say canola because it is readily available here in the United States, it is inexpensive, and I did’t want to suggest people use vegetable oil because it sometimes has a weird taste to me. Olive oil is very popular here, but should not be used for this type of frying. If you use a different kind of oil it will still work, but it may change the flavor slightly. 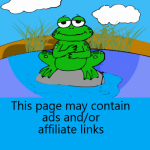 I tried to look up what oils are commonly used in Thailand. Coconut oil, Palm oil, Peanut oil, Soybean oil are what my research pointed to, sorry if that is wrong. 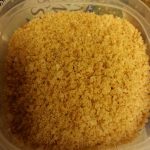 Out of these I probably wouldn’t recommend coconut and peanut oil, because they have stronger flavors and it will effect the taste of the cutlets. I would recommend using palm or soybean oil, but any standard vegetable oil should really work just fine also. I hope this helps. If you have any other questions let me know. Looks delicious! I always make breaded fish and it’s great. But I will definitely have to try this. Thanks for the tips. Breaded fish is great, you are right! 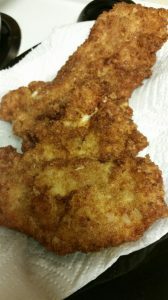 I make that too, but I must say these chicken cutlets have a special place in my heart! Hope you get to try them soon. Let us know how they come out when you do! Thanks for the comment! I can’t wait to try them! I love all things Italian and this chicken will make such a nice change from pasta and pizza! Thanks for the comment. Yes these cutlets would definitely be a great option to have instead of pizza. It is nice that all it takes to get a pizza is picking up the phone (unless you are cooking it yourself of course), but if have a little bit of time I highly recommend these Italian Fried Chicken Cutlets! They really are delicious, just talking about them is making me want to make some right now! Let us know how it goes! I have copied the recipe and hope the end product will be as good as yours. I love Italian food so I will be sure to try the recipe. I will not use the pepper dust because the recipe has pepper in it already. I used cayenne pepper in my recipes. 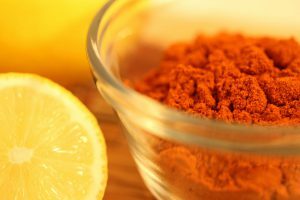 Can I use Cayenne Pepper in this recipe? Yes, of course, cayenne would be perfect to give this a little spice! I think cayenne is great because its not super spicy, but still gives it a kick. Much easier to get away with in a group setting than habanero or ghost pepper dust. Can’t wait for you to try it, make sure and let us know how it turns out! Fried chicken cutlets are my second favorite meal, next to chicken tenders. This Italian fried chicken cutlet recipe has some nice flavor combinations with the croutons and spices. I would personally eat it with hot sauce and some macaroni and cheese. Have you done any videos on cooking these recipes? It’d be very interested in checking that out if you have. I like your Hot Sauce and Macaroni and Cheese idea! That is the really great thing about these cutlets, you can really do anything with them. You asked about a video, I have not made any cooking videos as of yet. Honestly, I’m not sure I would even know how to do it…but it does sound like a really fun idea, so I will try to figure out the best way to go about it! Thanks for the suggestion! Hopefully I will get some videos on here really soon! I really enjoyed reading about this recipe. All of the information you provided is great, but if I am looking back on this page to cook this recipe you should have a viewer friendly SHORT version of instructions as well. Could you make a summary of some sort as well? Thanks for the comment and suggestion. I will work on figuring out a way to include a short version of the recipe. It probably wouldn’t hurt to try to do that with all my recipes. I will get going on it asap. Make sure you come back soon to check it out and let me know what you think. Thanks again! I went ahead and put a summary of the instructions at the end of the article. Hope it helps! Let me know if there is anything else I can do, and make sure to come back and let us know how you cutlets turn out! That looks like a tasty dish. And with all these special tips and advice, you can’t go wrong. Good advice for the breading for a good result. I think the Seasoning and Coating is the secret for the perfect taste. This is a recipe to go for. Thanks for the comment! I agree, a good coating with the right texture and flavor is so very important. It will truly make or break the dish!